The thing most immediately noticeable when one looks at the inner sleeve of Atlantic Crossing is the huge, dark, blank space. At the foot, in some kind of Art Deco typography, are listed the credits; a long, impersonal list which doesn’t even bother to tell you who plays on what (a situation, I regret to report, not rectified by 2009’s 2CD deluxe reissue). There is, provocatively, no matiness whatsoever; no photos of Rod goofing around with the musicians, no self-deprecating, self-penned sleevenote…and certainly none of the musicians who had contributed to his British records. Make no mistake; Atlantic Crossing stands, or was made to stand, for a complete break with the past, the putting away of childish things and the assumption of a new seriousness. This was understandable in the circumstances – Stewart’s solo contract with Mercury had expired and he was now fully signed to Warner Brothers; he had fallen in love with Britt Ekland; he didn’t fancy having to pay 83 per cent top rate income tax, so decamped from London to Los Angeles – but this did not stop, indeed may even have encouraged, some of the worst and most damning reviews of a rock album I can remember. Their gist was the same: Our Rod has sold out, he has ditched the Faces for anonymous, shiny sessionmen, he is a traitor to his own art, he has stopped being Our Rod and turned himself into Rod Stewart plc, an international brand for anonymous hotel lobbies and airport lounges the world over. He has become a decadent. The facts, as usual, lie somewhere in between, and since it is not the job of this blog to recycle received wisdom but to assess fairly what is in front of it, the facts here may prove helpful. When Stewart left for the States and commenced preparatory work on his new album, he did not intend to abandon the Faces, indeed was contractually bound to do one more tour with them. But Stewart and producer Tom Dowd listened attentively to them in LA, at work in the studio, for an hour before regretfully agreeing that they could not provide a suitable backdrop to the kind of music he wanted to make. Moreover, Stewart did ask his old songwriting foil Martin Quittenton to make the journey with him and help write some of the new songs, but since this would have entailed being on the road with the Faces, the mild-mannered Quittenton settled for a quiet life. Not unnaturally, this long-standing fan of Stax and Atlantic wanted to avail himself of the best musicians he could find. He met up with the MGs (if not Booker T) and got on well enough with them, although none of their initial collaborations made it to the final cut (they appear on the second CD of the 2009 reissue, including a scorching reading of the Bee Gees’ “To Love Somebody”) and there is no track where all the MGs appear together. Hence the sessions with Muscle Shoals’ finest, at the Hi studios in Memphis, and also in New York, LA and Miami, all with first division American session musicians (drummer Nigel Olsson, on loan from Elton John’s band, is the only other Brit to appear). The notion was not to make the album a series of soundalike tracks, but the central problem here had nothing to do with geographical disparities. On the advice of his then manager Billy Gaff, Stewart divided Atlantic Crossing into two halves, a “Fast Side” and a “Slow Side,” and it is on the “Fast Side” that the album’s shortcomings become apparent. The symbolism of the cover was clear; Stewart has one platformed foot placed in the New World, but he is looking backwards at the Old Country, and more significantly has one foot still on British ground. True, he couldn’t have stayed with a formula which had outstayed its welcome; Smiler really had been the last hurrah for that method of working, and although it sold well enough to get to number one in the UK (and therefore into this tale), it only stayed on the album chart for twenty weeks, compared to the eighty-one weeks racked up by Every Picture Tells A Story. But when “Three Time Loser” gets into its stride, you can’t help wondering whether Rod wants to have his cake and eat it. Yet another Jack-the-lad (or Rod-the-Mod) shaggy dog story (this time about venereal disease), it doesn’t take long for the casual listener to notice the disparities; the musical backing is a little too clean, the backing singers too efficient, the tenor sax soloist too smooth, and, above all, Rod, a little too desperate to impress with his whoops, trying his damnedest to convince us that he’s still the same old pub-rocking Rod Stewart despite his full knowledge that the goalposts have been moved. The problem is actually quite simple; he is obviously trying to find his feet in a new environment, and although the musicians are evidently more than keen to help him along with this material, he and they are not quite speaking the same language, and so there is a problem with aesthetic incompatibility. The problem continues to manifest itself in “Alright For An Hour,” another would-be lad’s rave-up which guitarist and co-writer Jesse Ed Davis seems more determined to turn into pop reggae (although Davis’ unfailingly inventive guitar playing is a real benefit here, as is the bass playing, whoever is playing it). With “All In The Name Of Rock ‘N’ Roll,” Stewart makes his first lunge towards an all-out rocker, complete with police siren and horn section, but despite many inventive touches – for example, a drum intro which squarely predicates the Undertones’ “Teenage Kicks” followed by a minimalist John Cale top register one-note piano riff – he doesn’t quite pull it off, and here another problem becomes extremely noticeable; Stewart’s voice is too far back in the mix. He doesn’t impose himself upon a song like he used to be able to do. Hence, although the band works up a reasonable head of steam, and the central guitar riff is good and compelling, the track simply drags on for too long and has no choice but to come to a fairly abrupt halt, like a train having run out of fuel. Nor does Stewart’s cover of “Drift Away” help solve matters (this is not exactly a “fast” track); Dobie Gray’s original was almost by definition a record of the Watergate period, a reflection by a survivor on what had brought him to this state of resigned acceptance in the first place. Fatally, Stewart substitutes the “free” in the chorus of “Give me the beat, boys, to free my soul” for a second “soothe” and it just doesn’t carry emotional weight; the same can be said of Steve Cropper’s pointillistic and frankly over-fussy guitar lines – again, he seems to want to turn the track into reggae, and the overmiked wah-wahs on the choruses are uncalled for. The side’s closer, “Stone Cold Sober,” a Stewart/Cropper collaboration, is also, however, the side’s saviour; if the “Fast Side” is a chronicle of two supposedly incompatible musical camps struggling to learn each other’s language, then “Stone Cold Sober” is the result of their finding a common ground. At last, voice and band seem to breathe in and out of each other, rather than being flashily superimposed; for the only time on this side, we get a picture of musicians pounding away in a studio. Furthermore, it is the latest entry in the “Out-Stone The Stones” contest – Ronnie Wood in particular must have heard this and growled his fury – and by some distance the record’s best rocker. Here everything – rhythm, horns, voices – blends together with a great naturalism, and it is from this point that the likes of Primal Scream derived their inspiration. The track fully merits the enthusiastic studio applause which ends it. Rapprochement has been reached. Then, on the “Slow Side,” Stewart is given the pace and air for his interpretive voice to breathe and flourish – something which certainly wasn’t the case with the ballads on Smiler. His famous cover of Danny Whitton’s “I Don’t Want To Talk About It” brought out a sensitivity and compassion in his performance which had for some time been absent from his work. The 1971 Crazy Horse original falls apart while it is in the process of being performed; if I had not known better, I would have taken it for one of those Lou Barlow lo-fi Sebadoh tryouts on the early Dinosaur Jr albums. But here, Stewart is not rushed by the guitars or bass, or by Arif Mardin’s strings; they all appear to be in conversation with him, or at any rate listening to him. And Mardin’s final key change and huge question mark of an ending are touches of genius. “It’s Not The Spotlight,” co-written by Gerry Goffin, is also a fine track, helped greatly by David Lindley’s excellent mandolin playing and some awe-inspiring bass work; my guess is Lee Sklar, but my apologies go to Donald “Duck” Dunn, Bob Glaud and David Hood, the other bassists listed in the credits, if one of them was responsible. More important than any of that, however, is Stewart’s magisterially reflective performance; this is an exhausted but happy love song for adults, performed by and for people who have lived through the unimaginable, and opened up an area hitherto largely ignored by rock; what happens when the rockers start to age? All that remains is the venerated “Sailing.” The Sutherland Brothers Band’s 1972 original was not unknown to American audiences – here it flopped, though was included on K-Tel’s 22 Dynamic Hits Volume 2 - and perhaps as a result Stewart’s version didn’t do particularly well in the States as a single (although one has to correct the underselling of Atlantic Crossing’s success in the 2009 sleevenote; the album still made #9 on the Billboard chart and was certified gold). Elsewhere, however, and particularly in Britain, the single of “Sailing” went through the roof and was instrumental in introducing Stewart to a larger audience who wouldn’t necessarily have bothered with, or even heard of, Never A Dull Moment or Ooh La La - and it was certainly crucial in making Atlantic Crossing, for which the song stood as both finale and symbol, the staggering success it was here; reissues included, it stayed on our charts for a total of eighty-nine weeks. How does Stewart’s “Sailing” stand up, however? Lena ventured the opinion that the song was a sort of compromise between Randy Newman’s “Sail Away” and Steam’s “Na Na Hey Hey Kiss Him Goodbye.” Myself, I note the involvement of Steve Cropper and the general theme of water and would label it the obverse of “Dock Of The Bay” – this is no aimless roam; Stewart sounds vulnerable at times but knows exactly where he is going and how to get there. He sounds regretful – as only he could – because he knows he’s leaving an entire life, a whole history, behind him. But, as with so many “classic” rock singles, “Sailing” makes far more sense in its original context; Mardin’s strings swell up as Stewart pulls away into the sunset, towards the darkness – the singer is saying his true farewell to “us” so long as he can remember who “we” are supposed to be. So the blank, dark space represents the unknown, and Atlantic Crossing, though fitful in finding its goals, deserves more than the history which it possibly gave to itself, as ready-made as the modest pun latent in its title. One could therefore superficially dismiss Horizon as yet another symptom of the increasing shift in the albums market towards an older, more conservative demographic. But even if the Carpenters had made the record for no other reason than it was time to make a new album, there is something else going on here that the above does not quite explain. Put together as a concept album, mimicking the progress of a day from dawn to dusk (“Aurora” and “Eventide” are different versions of the same tune), there are songs about gambling (“Desperado,” “Solitaire,” “Happy”) but mostly songs about waiting for something - anything - to happen; waiting for the postman to deliver a letter, or dithering over whether to leave or stay with her lover, the ageing cowboy waiting for a miracle to come, the lonely man pretending no miracle will ever come. With “Aurora” a new day dawns, and the echoes of sadness die away, or are hoped to die away (for this album never escapes the cloud of sadness which casts a huge, enveloping pall); “Only Yesterday” with its white bread Spectorisms (including surprisingly forceful drumming from Jim Gordon) tries its best to pretend it’s liberated (the opening line goes “After long enough of being alone” – already she is trying too hard), it never quite convinces; nor does the very similarly orchestrated Marvelettes cover, with Karen on drums and good solos from Bob Messenger’s tenor and Tony Peluso’s guitar. Both of these can be traced back to the oldies medley on Now And Then bookended by “Yesterday Once More” and share the foreknowledge that the past can never be reattained – on both, castanets rattle like buried snakes, and bells toll. “Desperado” doesn’t approach the barren poignancy of the Langley Schools Music Project reading and makes no more sense of the song’s confused poker analogy, but in the “hunger” of “Your pain and your hunger,” Karen’s voice cracks for the first time. It cracks several more times throughout the epic reading of “I Can Dream Can’t I,” the record’s deliberate centrepiece; for instance, the “belong” of “You’ll never belong to me,” the “disillusion” of “There’s much disillusion there,” the penultimate “dream,” the second “sad affair” of “My heart is a sad affair.” Above all, Karen seizes and sits on the “conclusion” of the song’s prelude quoted at the top of this piece, and that prelude seems to me the cynosure of the record, the point where fantasy and reality meet to create a horizon. Billy May, then in his late fifties, was prevailed upon to provide an arrangement (here co-credited with Richard), and treats it as he would any Sinatra ballad; quiet rhythm rising to meet strings, a Dorsey-echoing trombone chorale, a wandering Pete Jolly piano solo, and a strings/harp coda to end. If only Richard had resisted the temptation to harmonise with Karen in the song’s closing ninety seconds – presumably intending an Andrews Sisters pastiche – this would have stood as one of Karen’s great solo performances; as it stands, it is one of the great Carpenters records, and also one of the most unnerving. Side two commences with “Solitaire,” a song Karen didn’t particularly like, and despite its good moments – Joe Osborn’s initially inventive bass, Gordon’s increasingly rhetorical drumming, a particularly emotional and committed second verse vocal – it doesn’t quite work; the string arrangement is too slushy, and as a performance the song compares unfavourably with (in Britain at least) Andy Williams’ more famous reading (a top five hit here in early ’74) due to different verse lyrics but mostly to Karen’s obligation to sing the song in the third person (“And keeping to himself/He plays the game”), which necessarily places some emotional distance, as opposed to Williams’ first person delivery (his version works because he is able to convey his inner pain; you never doubt that he is singing about, and to, himself). Meanwhile, “Happy” isn’t a bad song per se but the listener remains unconvinced about any happiness, a feeling not dispelled by the strange Moog solo and the even stranger one hand clapping to fade. By now the light of the afternoon is beginning to usher in the uncertainty of twilight, and the already dark mood grows even darker. John Bettis considers “(I’m Caught Between) Goodbye And I Love You” his best collaboration with Richard, but despite the moderately inventive, steel guitar-dominant arrangement and a fine vocal by Karen (including a very bleakly delivered second verse: “Then I may have to let you go/If only to survive”), the song suffers from a weak chorus and generally underpowered playing. This is strong stuff, and although Bowie or Patti Smith could\have come up with these words, I doubt whether they could have poured as much conviction into their performance as Karen does; she is tearing down the cosy middle-of-the-road façade, demanding to be taken seriously – yet still caring enough to deliver that final, tender, pleading “free.” Walking a bridge between the Carly Simon of “That’s The Way I’ve Always Heard It Should Be” and the Aimee Mann of I’m With Stupid, this is one of the key feminist songs of its decade, and a palpable declaration of principles. Maybe Macca just wanted to lie back and have a good time. 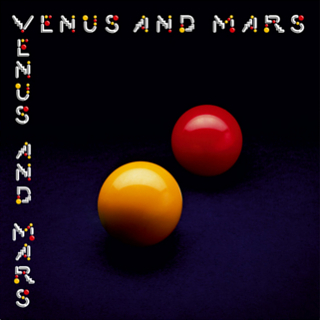 The album was recorded in New Orleans, a relative comfort following the toughness of Lagos, but where Band On The Run worked against the toughness and loneliness – the artist forced back onto his own resources - Venus And Mars frequently sounds too comfortable (i.e. drunk and/or doped), as though McCartney no longer has to try. And, in truth, he didn’t; if he wanted to make an album for his kids full of thirties pastiches and whimsical Marvel Comics homages, then didn’t (as he saw it) he have the right? If this had been anybody in 1975 then I doubt a single word would have been expended on the record. But this was McCartney, from whom one expected a certain quality threshold – still, how do I define that “one” in the face of the ten million people who bought and loved the record? For them, McCartney still existing was enough, and from the American point of view I’m sure songs like “Rock Show” and “Magneto” sounded ideal on a sunny morning, cruising past the Wells Fargo Bank and the Biltmore Hotel. This timid democracy, however, helped ensure the flimsiness and inconsistency of Venus And Mars. I don’t agree that McCartney simply slacked his way through the record; some care was obviously taken with the sequencing and segueing, and it is clear from the title track reprise, at least, that some concept took root in his mind. The trouble is that the good and clear moments are so distantly spaced as to be rendered meaningless, and the gaps are filled by largely irredeemable tosh. The title track, for instance, is pretty and heartfelt enough, despite McCartney’s sometimes arch diction (“sports a-re-NAH”), and its bridge somewhat more than that (it later returns with more echo on McCartney’s voice, various Moog noises and an impressive, improvised choral line which put me in mind of Granddaddy’s The Sophtware Slump as well as the wheaty spirit of 1975 which the likes of Advisory Circle and Goldfrapp try so hard to recapture). But no further are our minds engaged than we are shoved into the limp “Rock Show.” Despite Allen Toussaint’s piano (taking “Lady Madonna” back to its rightful home at fadeout) and the song’s occasional moments of invention (e.g. the tuned clock chimes in the extended middle eight), the song is misguided in both conception and execution (it sounds like a half-hearted Kiss having a go at Elton’s “Love Lies Bleeding”) with its jibes at Jimmy Page and glam rock (the latter set against, I ask you, cod-reggae and spoken in McCartney’s comedy “posh” voice, crowned with deranged howls of “KIT-TAY!”) and stupid lyrics (“It’s Silly Willy with the Philly Band” – might I suggest that the line “The tension mounts, you score an ounce” contains more than its allotted modicum of truth?) making the 33-year-old Paul suddenly sound very old and reactionary indeed (having a go at glam in 1975?). It seems nothing more than an attempt to crowbar famous venues into one song, and the music hardly suggests a brighter tomorrow. “Love In Song,” in contrast, is one of the simplest and most moving songs Paul ever wrote, a straightforward and clearly heartfelt dedication to Linda, delicately outlined by harpsichord and modest Moog with its refrain of “Happiness in the homeland,” together with subtle strings and McCartney’s most committed vocal performance on the record; hear how his voice falters at the end of the line “My eye cries out a te-ee-ear.” This song is so good I can imagine the Stylistics doing it justice. When McCartney drops the pose and tells his truth, his music works; but “Love In Song” is quickly succeeded by the ridiculous “You Gave Me The Answer,” the latest of McCartney’s interminable line of straw boater/megaphone vaudeville period pieces, and by some distance the least convincing, not just because of the opening piano improvisation on “Maybe I’m Amazed,” but because as a pastiche the song sounds uncomfortable, ill-fitting; the melodic progression and McCartney’s at times over-passionate vocal both threaten derailment. “Magneto And Titanium Man” still carries a bit of thirties sauce about its seventies AoR strut – there’s a bit of Billy Swan’s “I Can Help” and quite a helping of Steely Dan’s “Reelin’ In The Years” – with some incongruous blasts of McCulloch guitar. McCulloch does better with his solo on “Letting Go” which again betrays McCartney’s familiarity with mid-seventies American FM radio (think Linda Ronstadt’s “You’re No Good” with extra horns and Moog). The latter song, another ode to Linda which might properly be retitled “If You Love Somebody, Set Them Free,” sees McCartney’s voice working back towards commitment without ever touching it; he drops out before any primal scream catharsis can be attained. “Spirits Of Ancient Egypt” is just plain weird, and not in a good way (the track has, according to McCartney, “a couple of T. Rex touches” – what the hell was he thinking, or on? ), coming across as an ungainly halfway house between Gene Vincent (Laine’s brave but desolate “You’re my baby”s, but then he has to cope with driving a Cadillac across the Irish Sea) and Midge Ure’s Ultravox (when Paul and Linda come back for the chorus and synths take centre stage). McCulloch’s “Medicine Jar,” meanwhile, sounds as a generic a 1975 rock track as one could find; it could literally be anyone or anything, and only McCulloch’s vague vocal resemblance to Ringo suggests why this was given the time of day anywhere, let alone points from a multimillion seller. This notion of “democracy” certainly doesn’t help with the record’s flow. Nor does the tortuous “Call Me Back Again,” a forlorn, and unending, attempt to recapture the spirit of “Oh Darling.” McCartney admittedly doesn’t help matters with his vocal, which begins painfully out of tune, and despite some subsequent improvement his performance is quite overcooked, descending easily into pseudo-Plantisms (“When I-hi-hi-hi-hi-hi was a just a little baby boy”; look, McCartney, when you were a little baby boy you didn’t HAVE a telephone). The track, like too many tracks here, drags on and on under the impression that it’s “Hey Jude,” which it most definitely isn’t. A moronic introduction of counterfeit jive talk notwithstanding, “Listen To What The Man Said” shows how good Wings could be when McCartney dropped the Fab Wacky nonsense and concentrated on writing pop songs. Here he finds confluence with the seventies AoR stream, helped I suspect to a major extent by guest guitarist Dave Mason and guest soprano saxophonist Tom Scott – the flow is irresistible, the Moog bass non-gratuitous and the lyrics erring on the side of simplistic rather than foolish. The build-up to the climax – “The wonder of it all, baby” – is exciting, the group sounds committed, and the transition from lead guitar to ‘cello (and thereupon the full string section, and the slow section) is both unexpected and wholly natural (rivalled only by the similar section near the end of Paul Simon’s Lennon tribute “The Late, Great Johnny Ace”). The trouble here, again, is that, having created a variety of possible directions with that final section, McCartney settles for the most mundane. The “Treat Her Gently/Lonely Old People” sequence strives to emphasise with the plight of the old, but has nothing of the acrid poignancy of Scott Walker’s “Two Ragged Soldiers” or the basic good humour of Bob Hope’s many versions of “Thanks For The Memory”; instead we have a sagging waltz with the only inspired arrangemental touch being the sudden, stinging surge of string synthesiser – like an injection of sodium pentathol – succeeding the second statement of the phrase “old people’s home.” Finally, the old people being represented (“Nobody asked us to play”) presumably wander off camera to the strain of Tony Hatch’s theme from Crossroads, heading back to their televisions to watch the surreal interplay of actors and camera booms, improbable plot turns, ripe overacting and unscheduled Pinterisms which that singular soap opera encapsulated. McCulloch plays the tune as though it were still “Something In The Air” and the day fades to a Macca mutter and a cover which suggests not so much Botticelli’s painting of Venus And Mars as a couple of snooker balls in space. Wings went on to score more number one albums in the States, but not here; songs like “Let ‘Em In,” “Silly Love Songs,” “Mull Of Kintyre” and “With A Little Luck” proved them to be one of the great singles acts of the decades who never managed to make a good album (Band On The Run being largely a solo McCartney effort). I’m sure McCartney still isn’t bothered by that, really.